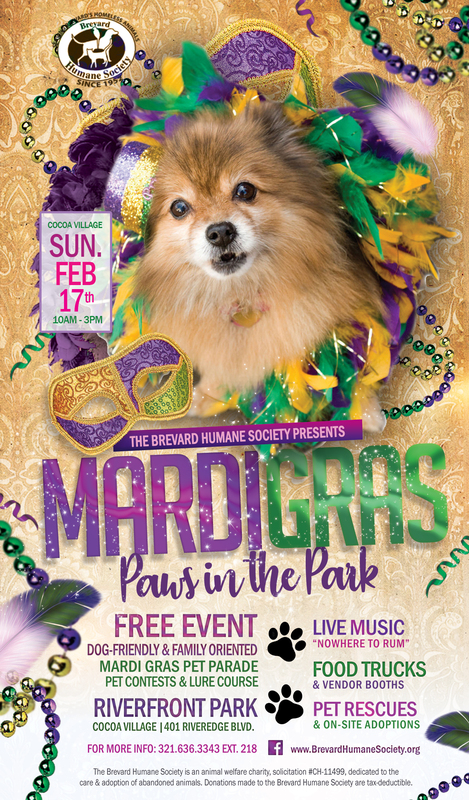 The Humane Society’s 13th Annual Mardi Gras “Paws in the Park” event will roll through Riverfront Park in Historic Cocoa Village on Sunday, February 17th. The fun kicks off at 10:00am as pets don their best costumes and line up for a parade through the park. After the parade, pets may enter the “Best Trick”, “Companion Look-A-Like”, and “Best Costume” contests while their humans enjoy vendors, baked goods, adorable adoptables from animal rescue organizations, and a silent auction. The main highlight at the “tail” end of the event is the coronation pageant when Cocoa’s King and Queen of Mardi Gras will crown their royal companions. Prizes will be awarded and everyone is sure to have a howling good time as additional entertainment will also be provided by “Nowhere to Rum” Band and Swift Paws Lure Course. Mardi Gras “Paws in the Park” is open to the public and admission is free. For additional information regarding this event or to become a sponsor and/or vendor, please call 321.636.3343 ext. 218,email: events@brevardhumanesociety.com or visit our website at: .www.brevardhumanesociety.org/mardi-gras. Pre-registration of pets is strongly enccouraged!